I heard a nice presentation by Kim Zlimen on Friday concerning the proposed Bottineau Transitway. 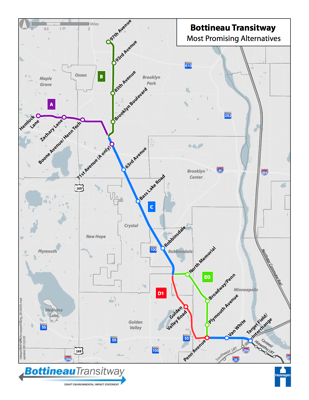 Bottineau Transitway is a proposed line from downtown Minneapolis to the Northwest. Currently planners and decision-makers are evaluating technologies and rights-of-way. They seem to have two proposed alignments through Minneapolis, one along Penn Avenue (D2 in the figure) and another through Theodore Wirth Park (D1). If LRT, and that is the direction things seem to be going, the Penn Avenue alignment requires taking houses. There are alternatives (e.g. using Oliver Ave for one or both tracks) that were ruled out that did not require taking houses, but obviously required taking roadspace from parked (and moving) cars. To say those were too disruptive (by requiring people to park a block away), and that taking houses was not, is strange. Maybe I am just cynical, but I think that the planners were cynical by defining the on-street alternative as requiring the taking of houses on Penn Avenue. In the context of a post-Rondo Twin Cities, house takings, especially in a poor neighborhood make that an unacceptable alternative, and thereby force the alignment through the Theodore Wirth Park. In the end, if the aim is to serve suburban commuters to downtown, using the Park alignment is probably better for those travelers. If the objective is to serve transit dependent populations in North Minneapolis, this completely misses. The claim is that both objectives are important, but clearly there is a conflict here. I suspect this is an application of the Overton Window, by framing the choices in a particular way to get the desired outcome. This does clear North Minneapolis from LRT, making it more amenable to streetcars, which is perhaps the objective (… See, North is underserved by LRT, we simply must provide Streetcars). The report supports the use of accessibility as a standard performance measure. h. Accessibility as an integrated transportation-land use measure. Trip- based mobility measures are the starting point for accessibility measures, but they are blind to trip purpose or opportunity; they just measure the performance of trips within a given time window. Accessibility measures layer on the trip purpose or type of destination represented by the trip and are meant to measure the ease of reaching opportunities – goods, services, activities and other destinations. Three factors affect accessibility: congestion (or impedance), transportation system connectivity, and land use patterns. Thus, accessibility measures capture all four of these simultaneously; it is still important to understand the contribution of components, especially mobility as this is under more direct control of transportation agencies and easier to communicate to a general audience for a greater range of purposes. Note the accessibility can apply to the ease of getting to activities (such as jobs, recreation, shopping) or aspects of the transportation system itself (freeways, transit route, bike facilities). Bradley Heard @ GGW Ride The Tide of light rail, Virginia Beach – Greater Greater Washington: “Dubbed “The Tide,” South Hampton Roads’ light rail system made its debut in Norfolk on August 19, 2011. The initial $338 million segment, operated by the regional transit agency, Hampton Roads Transit (HRT), is 7.4-miles, has 11 stops, and is currently located only within Norfolk’s city limits. Does this appall anyone else? From Autoblog Green: Mazda CX-5 joins the cast of Dr. Seuss’ The Lorax: ” The computer-generated film from Universal will feature a “Seuss-ified” Mazda CX-5 rolling through a forest of lollipop-like truffula trees.